Paper Pearl: Yeehaw for Baby Cowboys! While I have been mostly concentrating on the invitation side of Fanciful Ink lately, I have not forgotten about my love for designing fabrics. My mother recently had a chair upholstered in my "Sunny" fabric, which can be bought on Spoonflower. I have a few designs for sale on the site. You can pick your yardage and fabric weight and see what it will look like in the preview. Fabric swatches are available if you are just thinking about a certain fabric as well. The fabric I have ordered has been quality! There have been many contests on Spoonflower and recently they joined with Michael Miller Fabrics to create Project Selvage, a design contest for a baby boy fabric. The winner gets their own contract under Michael Miller Fabrics! So this could possibly be my big break or could simply be another fabric design for me to sell on Spoonflower! 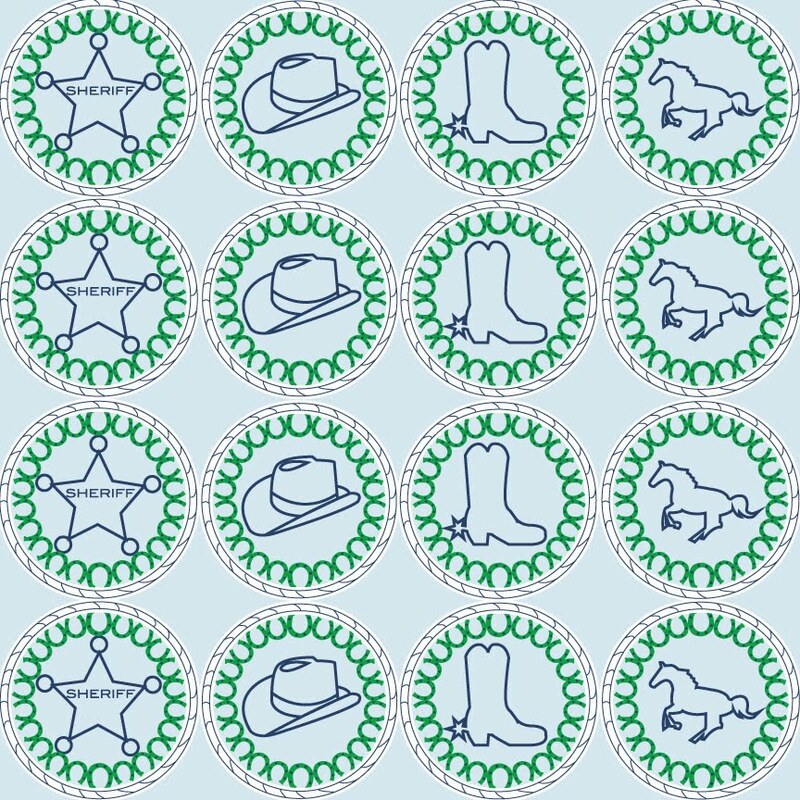 Either way, I am pleased with my "Baby Cowboy" fabric. Of course I think it would be much easier to design a baby girl fabric, but I love the challenge of the baby boy. I chose to keep the traditional light blue, with a slight undertone of gray in it. I paired it with a navy and kelly green. I knew I wanted a cowboy theme but didn't want to just place cowboy items strategically in my artboard area. 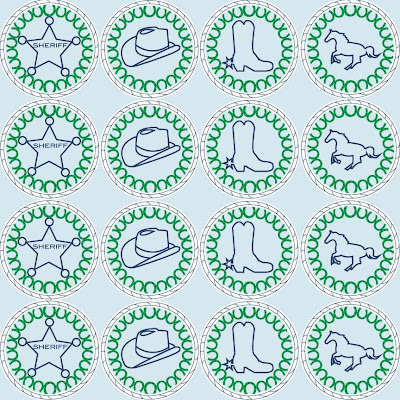 So I chose to make medallions of three layers: the inner layer has a either a sheriff's badge, cowboy hat, boots with a spur, or a horse. I got stuck after the first three items and needed one more thing to complete the row. A horse of course! Every cowboy needs a horse! The next layer has a ring of green and navy horseshoes, followed by the outer ring being the white and navy rope. I plan on doing some coordinating fabrics to go along with it in the future. I love how it turned out and hope that someone loves it for their little boy as well! This fabric is not yet for sale, but if you're interested don't hesitate to let me know!